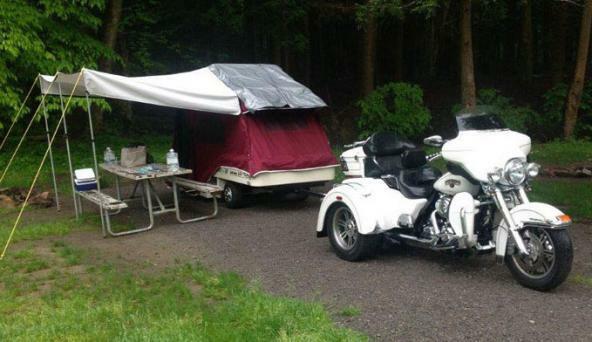 Whenever people want to go on a motorcycle trip and would like to enjoy camping along the way, motorcycle tent trailers are the perfect solution. 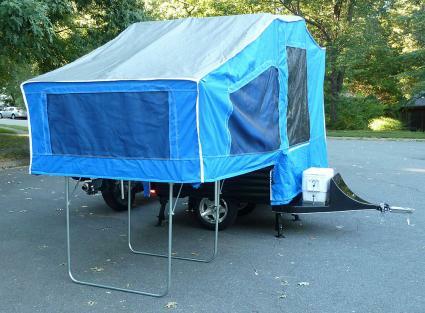 These unique RVs are sized and designed with the appropriate weight and dimensions so they can easily be pulled with a motorcycle. Trailmaster offers very small trailers that you can pull with a small car or motorcycle. They pop up into fair sized tent trailers, with some designs that extend to one side and utilize ground space next to it. Lite Tent Camper are very small and light, but offer the convenience of a basic tent with the option to add on a screen room, awning, and other useful features. Lees-ure Lite trailers offer one of the highest quality trailers that are also one of the easiest to set up. A unique folding design almost doubles the length of the trailer, adds floor space, and leaves enough room for a larger, comfortable bed. Open Road Outfitters offers several styles of lightweight motorcycle campers made of lightweight, breathable tent material and featuring simple designs. These are best for campers looking for a very basic tent experience in a simple towing package. Features on some models include carpeting and a screen room. Bunkhouse trailers are one of the smallest camping trailers on the market with options that include a table, cooler, screen room or clothes storage compartment. 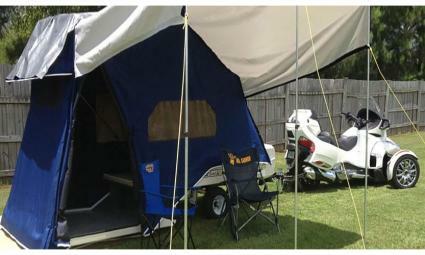 The following are typical features that you'll find with most motorcycle camping trailers. Larger "lightweight" tent trailers come with additional features like more storage, counter space, and even hookups for electrical and water. These trailers are often heavier and can require a larger motorcycle or small car for towing. When people buy recreational vehicles or trailers, they'll often decide to buy used in order to save some money. While it might e possible to find a good deal on a used model, it may be best to invest in a new camper. Keep in mind that the nature of a tent trailer is that the roof is typically made of a canvas or other material that is more prone to wear and tear. It's just like a typical tent, only a little more sturdy. So it's rare to find one in good enough used condition. For only a little more money you can buy one new and in perfect condition.